Superman, powered by Kryptonite, fights his way to Vandal Savage. With a little help from his friends Superman is able to free the heroes Savage had in captivity. Diana wants him to rest but Superman refuses and confronts Savage. During the course of their fight Savage knocks Superman into the Fortress which returns Superman to full power. Superman thinks about what led to this moment and prepares for the final battle with Vandal Savage and his allies. Story - 4: In the past I usually take this sort of moment to give something of a mea culpa in terms of being so hard on a story. I'm not doing that this time. No matter how good I thought this issue was (and it was good) the past seven or eight months have been a low point in Superman's history. I'm not saying he can't recover and I am not saying that none of it has been entertaining but between all of the press before the story started and how everything played out the "Truth" story arc (as I am calling it for the sake of convenience) was ill conceived, it wasn't earned and failed me as a reader on just about every level. I liked what I read in this issue. Pak and Kuder delivered a solid anniversary issue and they hit some great emotional beats. Clark was selfless and never gave up. He was concerned with the civilians that might get caught in the crossfire. He kept going after Savage even though the temporary powers given to him by the Kryptonite were killing him. 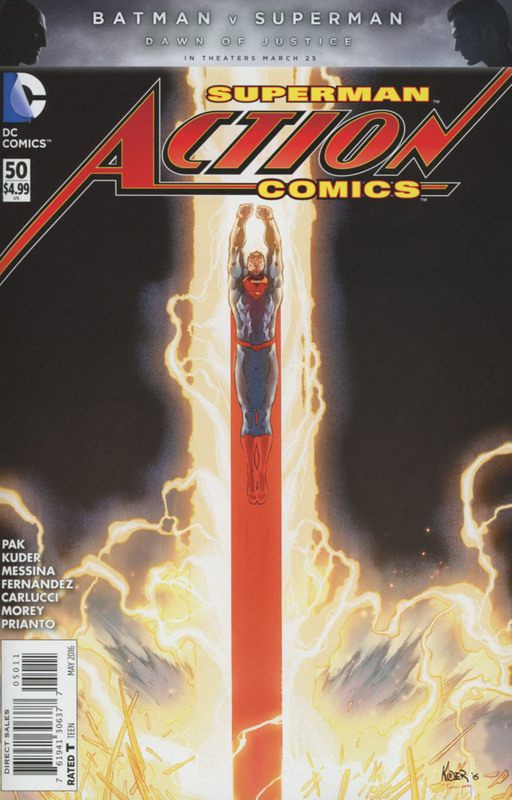 This was the Superman I expect from Pak and while you could argue that all of the times he acted "out of character" were for the sake of the story the fact of the matter is we haven't seen enough of the selfless Superman in the past five years to justify me giving that sort of thing a pass. Any attempt to show him acting "non-Superman like" fails because there hasn't been a consistent portrayal to compare it to. Whatever the case Pak and Kuder stuck the landing on this issue. They delivered all of the moments I have been waiting for and I even smiled at certain points and heard the triumphant music where the scene called for it. The moment where Superman gets his powers back was fantastic and I was happy to see it. More than anything I am happy that this story is over with and the next movement in the continuing Superman story is on the horizon. It's nice not to feel like reading the next issue will be a chore. I'm going to miss Greg Pak as a writer. I know I've been hard on some of his work but for the most part I thought he was the best Superman writer of New 52 era. It's just too bad that his run ended on this story. Art - 4: Once again we have a handful of artists working on this issue and the art, while looking different, blends together to make a very satisfying package. The page layouts gave this issue a series "final episode of the season" vibe and I liked the pages that tracked where we have been with this story and how it leads up to the big moment. The two page splash of Superman in full costume and at full power was fantastic and I really liked the computer effects in the background. Cover Art - 4: This is a great cover. It's powerful and gives us that great, "He's back!" moment that a lot of us have been waiting for. Variant "Batman v Superman" Cover Art - 4: These are cute variants and I like that DC is typing into the upcoming release of BATMAN v SUPERMAN. I'm not the biggest fan of these posters in general but it works for a variant cover. Variant Cover Art - 2: This covers presses two very specific buttons for me. 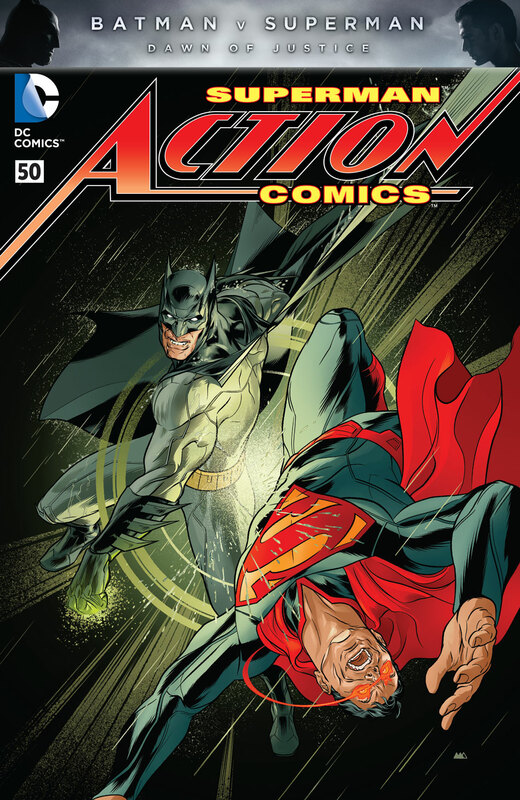 One, it's Batman punching Superman with a Kryptonite ring. Second, Superman has the whole angry red eyes of anger thing going on. I'm tired of both of these tropes so this cover does nothing for me.